As we pulled out of O’Neill Regional in Orange County, California, I was looking forward to a good trail ride on the new Kawasaki KLX250. If I had to place where the KLX250 would fit in the dual-sport hierarchy, I would say it’s an entry-level machine with some great new looks. How would it perform on and off-road? The new KLX comes in two new designs, with Lime Green, and Matrix Camo. 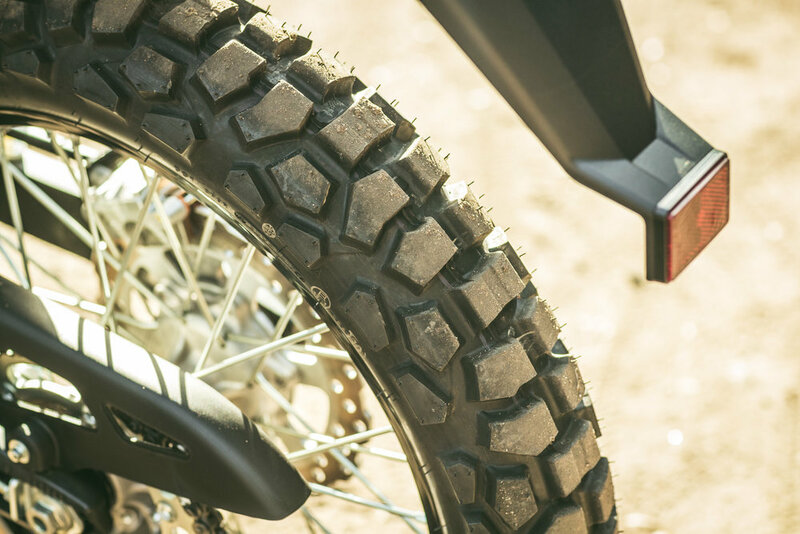 The styling is really cool in my opinion, as Kawi have taken some design cues from their motocross KX line with two-piece shrouds, KX front fork guards, and an off-road front fender. The steel chassis feels slim in the rider cockpit area, and the rider triangle is just right. We were soon into the windy asphalt, and the relative lighter weight (compared to a larger adventure bike) was immediately noticeable as the 250 proved very “flickable” and maneuverable on the tight pavement. After a few photo stops on the road section, we hit the dirt fire road in the direction of Santiago Peak. I had ridden this trail many times on my KTM 500EXC and also a big KTM 1090 ADV bike, so I knew that the water bars and rough rock sections up ahead would be a good test of the KYB 43mm front forks and Uni-Trak rear end. With 255mm of fork travel, and 230mm in the rear (that’s 10” and 9.1” in American) I was ready to take on the upcoming obstacles. As I launched of the first water bar on the fire road, I was fully expecting the suspension to make the nasty clack sound of the fork bottoming out, but no, not this time. Awesome. At 200+lbs I know I’m probably over the optimum weight for a 250 entry-level off-roader, but to have the confidence to hit the trail a bit faster and more in control without bottoming the suspension was a good feeling. The forks have compression adjusters, and I left them at the stock settings. I could have stiffened the forks up more, but it wasn’t necessary. Motor wise, the 250 was very smooth on the road, and although it took a while to get up to speed, once you had momentum on your side, the little KLX was able to cruise easily at the speed limit. The power once we hit the dirt was not as good as it felt on the asphalt, and the fact that we were going uphill for a while did not help the power issue. I had to really think about my line choices, and try and keep up my momentum in the corners. The KLX likes to run high in the engine revs, and if you can keep the bike over 6000rpm, then it goes pretty good. I often found myself at the top of second, or too low in third gear. I soon got used to being higher in the second gear revs, the uphill sections were no problem. When we got onto flat sections I started to feel better about the KLX power, although again momentum was the key word. We crested the trail and started to drop down the other side towards south Corona for a lunch stop. This section of the trail had much more loose rock than the earlier trails, and as we were pointed downhill, there was a lot of gravity-assisted power to add to the engine performance. The handling of the bike was spot on, and as I said earlier the rider triangle between hands, feet, and seat felt very comfortable and the standing up rider position was also good. After lunch were we reversed our course back to the Kawasaki HQ in Lake Forest, CA across towards Saddleback Peak. I was still blown away at how good the suspension was on this bike. At 304lbs curb weight the KLX is quite heavy for being such a small bike, but I was unable to bottom the fork whilst riding at a reasonable pace over some pretty good square edge rocks and the big water bars. Ok I did bottom out once, but that while I got a bit of decent airtime for the Kawi photographer. Overall an impressive fun small dual-sport, but if we were to buy one I would definitely look for some aftermarket engine mods, specifically an exhaust to try and find just a little bit more power. The Lime Green KLX250 retails for $5,349, and the Matrix Camo option is $5,549 and are available at Kawasaki dealers now.